Make sure your business, and home are protected by a reliable backup power solution! 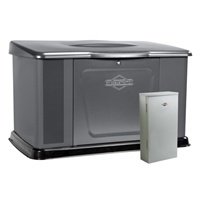 With a Briggs & Stratton or GE automatic generator system, you can rely on your lights, appliances, air conditioner, TVs or computers to stay on during a power outage. 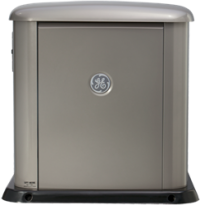 Standby generators are permanently installed and connected to your home or business natural gas line or liquid propane fuel source, thus assuring a relatively uninterrupted fuel supply. 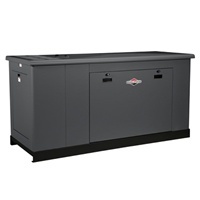 Whether you want to protect your home and family from a power outage by keeping the lights on and basic household appliances running with a 8kW backup generator, or you want to install a whole house system that can provide an entire home with enough power to run your heat or air conditioning units, or or if you need a large liquid cooled commercial standby system to protect your business, school or organization, we can design and install a system that will meet those needs. Please call us to to discuss your options and to find out how affordable a system can be.